Walking the "World's Greatest day hike" for free. In winter months, due to the snow, this is a guided tour. So, I am not sure if there is a way around fees. But, in the summer months, this 20 something km hike is a Freedom hike. You are welcome to start at the shuttle start point, Mangatepopo or the shuttle end point, Ketetahi. There is a paid shuttle is available for $30 dollars per person back to the start point car park. We are here to help you avoid that shuttle and the crowd of people it drops off. We hate crowds of people especially when you make an all day effort to be out in nature. 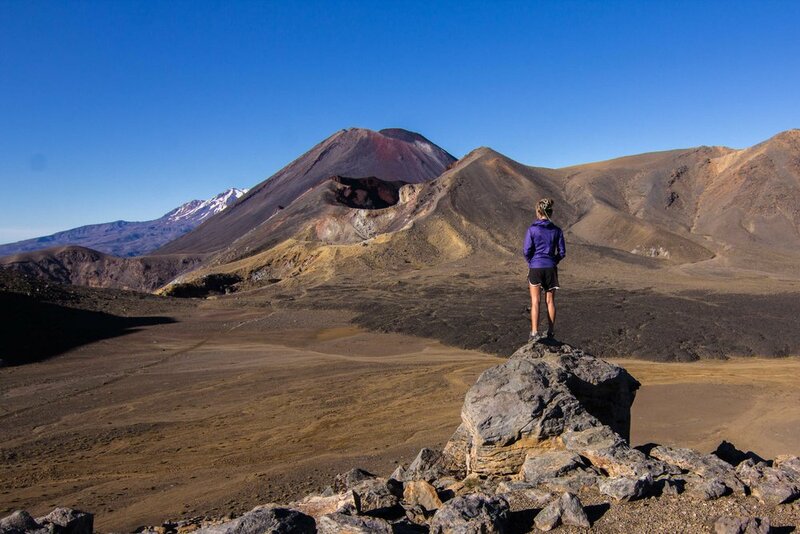 No joke, after 11am, be ready to encounter heaps of inexperienced hikers all over the trail. If you're hiking friends that also have a car and you're keen on doing the entire hike from start to finish, drop one car at the Ketetahi car park and drive back to Mangatepopo car park and begin. Sounds simple, but for some reason huge groups of people are still shelling out money for that shuttle together. I would do this very early in the morning if you want this place all to yourself for a couple hours. Make sure you're on the trail by 5-6am and you should be perfect. 2. Start at the "end point"
Second option for those that only have one car....Start at the end point, Ketetahi car park. 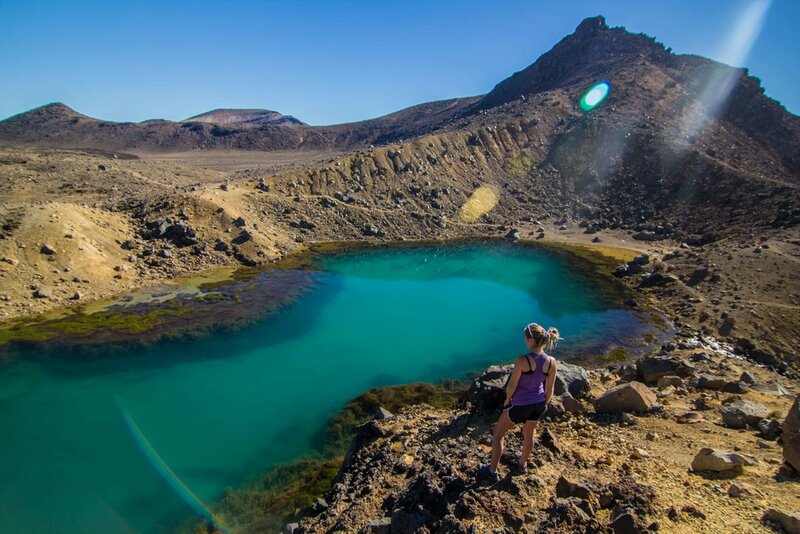 You won't do the entire hike, but you will see all the good stuff and you won't see a single person until the summit (Red Crater), if you start your hike at 5-6am. (Risky tip: If you park and sleep in your car at Ketetahi and get up and on that trail by 5 am, you will catch the sunrise over the Rotoaira Forest and Lake on the trail just as you pop out of the trees. Yeah, it isn't allowed to park at the car park overnight, but who is going to catch you if you're up that early? The parking attendants come at 6am. They will knock on your steamy window and shake their finger at you. They were pretty chill.) Once you've seen all the good stuff and summited, u-turn and head back the way you came in. The hike is a tiny bit longer this way, but we did it in 7 hours with walking around the lakes, taking pictures, and sitting and eating our packed meal. If you aren't the fastest hiker, allow 8 hours. If the risky tip in number 2 was too risky for you, don't worry we have 2 legitimate free campsites nearby. Waikoko Valley Campsite and Kaimanawa Roadsite Camping. They are both about 20 minutes away from Ketetahi Car Park. If you don't mind being around a bunch of backpackers, park at either and get up early. There are about 6 parking spots at Ketetahi. Odds are people have dropped their car there the night before already or slept in their car there. So there won't be any spots. You will have to park on the side of the unsealed road you came in. Overflow parking lines the East side of the entire road all the way toSH47. It starts on the left side (East side) about 50 meters after you u-turn and find no spots in the 6 car lot. Look for the blue P sign with the arrow pointing in the direction you came in. It's easy to miss, but it's there. Sometimes there are cones right by it. 4. Going old school. Hitch hike. Last option, start at the starting point park your car and do the entire hike. Then, go old school and hitch hike. We saw plenty of people doing it. I can't say how good your luck will be and I can't promise it will be safe these days, but in NZ, I am sure it probably is safe. When you hitchhike, always walk backwards facing on-coming traffic with your thumb up and making eye contact with the drivers, if you want to hit that soft spot in their heart. I don't recommend this tip, as you will be exhausted and you might have to walk an additional 7km to the car park, if someone drops you roadside at the turn off. Alright, now that we gave you the low down on how to save some dough, it's time to talk about that reigning title "World's Greatest Day hike." I think you might be walking thru there as confused as were were as to how they even came up with that. I've hiked in quite a few epic places that this place doesn't even touch. (Try Half Dome, in Yosemite, any day hike in Mt. Rainer, or plenty of Tassie hikes would knock this place out of the ball park). 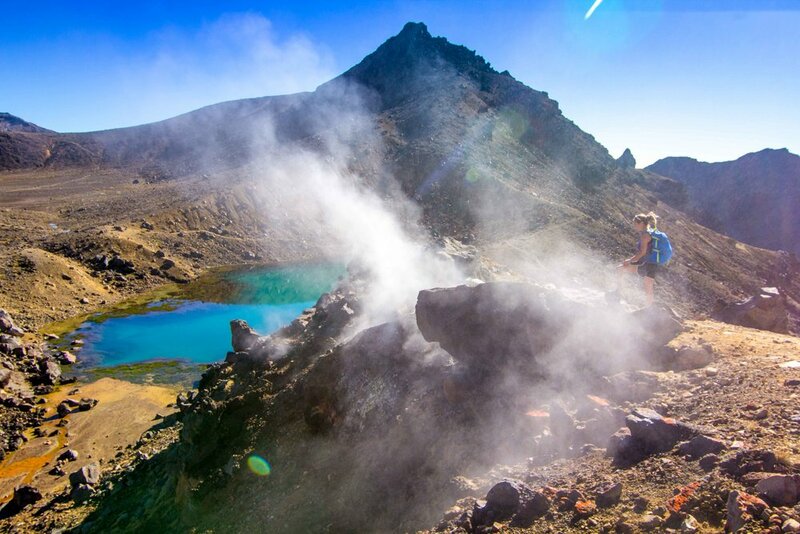 I really don't feel like this place should even be a contender, but that just might be my high expectations for New Zealand hikes and "world's best hikes" for that matter. In the car park, at the end, we heard plenty of people expressing their confusion as well. But if you are a LOR fan like me, then you'd probably wanna check out Mt Doom. I'm not at all saying this place sucked by any means. It was some of the craziest terrain I have seen and some of the craziest terrain I will probably see all in one place. With the earth steaming thru vents and crazy emerald colored pools, it sure is insane to see the power of Mother Nature, but I still don't agree with the title it holds. I think it has a little something to do with the excellent marketing for the shuttle companies to drive you 15 minutes down the road for $30 per person. 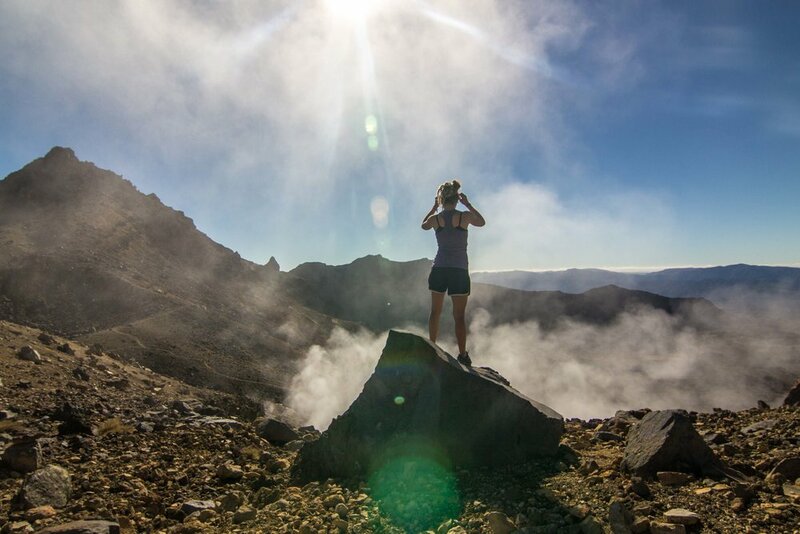 Due to it's picturesque popularity, New Zealand has become a pay to play out in Nature and this is one of the Great Walks that you can still play for free. Although I am not sure for how much longer it will be like this, it sounds like this popular hike has reached it's daily limit and might be regulated to how many people can cross the track in any given day. At that time, I don't know if there will be ways around paying to play at Torongariro.